It's been a while, but don't worry. There'll be a post on the missing month of comics. Right now though the focus is on the fresh stuff, if you count five days old as fresh. 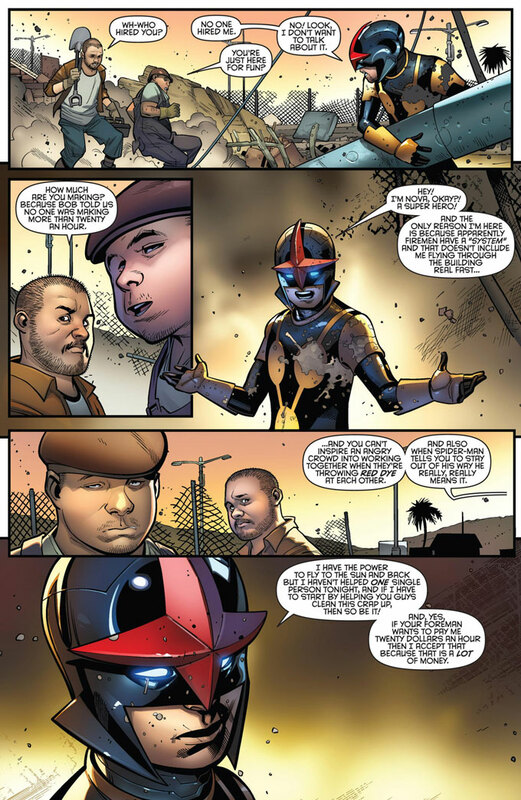 I'm a bit bitter that there's a new Nova, but Nova #7 is a great comic book. The series has been mediocre so far, albeit fun. Things are looking up in this issue as Nova learns some important lessons, like superheroes can't just barge into any situation and recognizing that New York City already gets too much attention in comics. At one point I was complaining about the lack of superheroics in superhero comics, so having a book where someone is actually learning to be a hero is welcome. This trend and the New Warriors tease are certainly reasons to celebrate. Things seem to be ramping up in the pages of Superior Spider-Man as each storyline that concludes organically flows into the next. Doc Ock's tightening grip is also exposing more cracks in his attempts at playing hero. 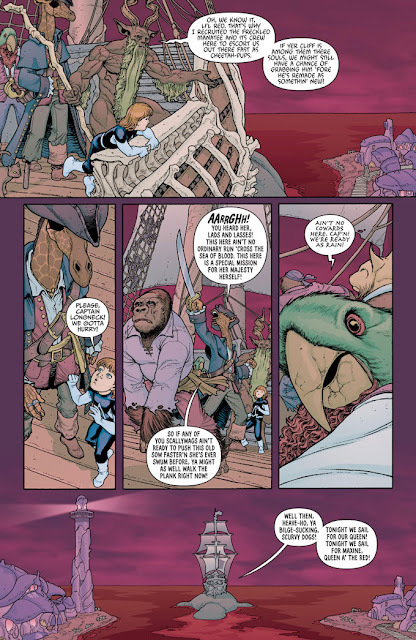 The capture of the Hobgoblin this issue was interesting, but I felt the best parts of #16 were the hooks meant to get the reader interested in the next installment. Completely unfair review time. Avengers #18 is part of Marvel's Infinity crossover event. Where it takes place in that event I'm not entirely sure as I haven't read the main Infinity story. I won't lie, "Avengers IN SPACE" interests me, but I am hesitant to part with another $4. Everything on paper sounds like a cool comic, but I'm tired of "events." Daredevil and Silver Surfer team-up to track down and capture a lying alien. Waid and Samnee do a fantastic job of telling the story. 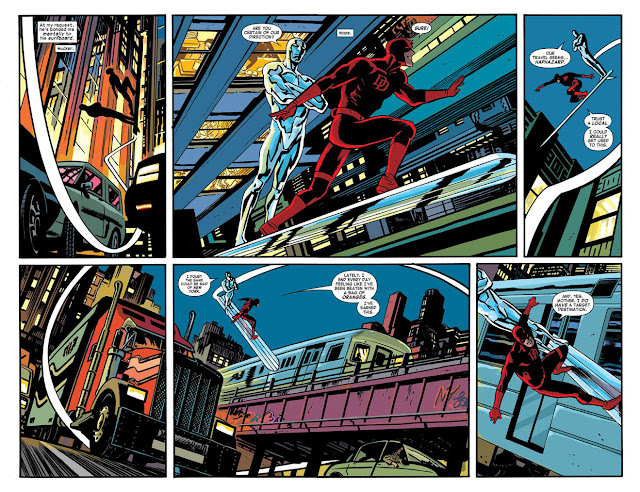 For those that missed the previous issues of the series, Daredevil can be a really fun comic. It's also further proof that Chris Samnee is entirely deserving of winning his Eisner. Only the most self-loathing would deny themselves the joy of reading Daredevil. I liked the first issue of Superman Unchained, but I was a bit apprehensive about some of the background stuff Snyder was setting up. The second issue was great from cover to cover. #3, though, makes me worried again. The secret military organization that has been controlling major conflicts and their resulting denouncement of Superman leaves a sour taste. You can't call out Superman for ignoring "real world issues" like not taking out despotic rulers and then take it back. Snyder seems to have written himself into a corner with this. It's not all bad; Lois Lane gets to show off her smarts with how she handles the crashing plane, and Luthor's "auto-pilot" suit is a thing of genius. Fear and dread swept over me as the comic opened with two not-Twitter and not-YouTube pages. Thankfully things picked up immediately afterwards. Buddy's self-righteous angst is A-OK in my book, but the real star is Maxine's fantastically grotesque tour through the Red with animal pirates (the fact that the annual wasn't something along the lines of "Tales from the Red" is a shame). The way the artists bring the creatures of the Red and other monsters to life is astounding. My interest in Animal Man had been low since the Rotworld story, yet that's not a problem anymore. The story so far of this digital comic: dude gets powers, dude squanders powers since he'd rather play videogames and eat pizza, giant monster shows up, dude has to use powers to fight giant monster. It's a rather simple premise, but one that is fun and offers a bunch of room to work with. The first two issues of Knuckleheads delivered laughs, and #3 certainly didn't disappoint. What was unexpected was a strong character moment to start the issue. While the guy with powers might be just a regular lazy dude trying to get by there's a sense that his best friend is envious and would use superpowers for "all the right reasons. Comics like this are something that humans are inclined to like, so go check out Knuckleheads.